The first time I looked at an option chain it reminded me of the first examination I took in Organic Chemistry…..I thought I was prepared for it but boy was I wrong! However, like most challenges (except perhaps organic chemistry) these hurdles can be overcome by simply doing your due-diligence and via repetition. For many experienced cover call writers, the knowledge gleaned from the option chain has become second nature and a source of information for our lucrative returns. Knowing how to read an option chain is an essential prerequisite to writing covered calls or any form of options trading. 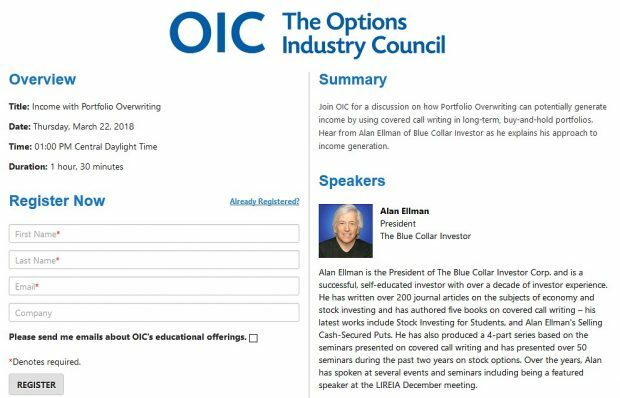 This article is geared to the novice options investor and those new to the BCI community. An option chain is a method of quoting option prices through a list of all options for a given underlying security. The option chain reveals the various strike prices, expiration dates and identifies them as calls or puts. 1- Strike price– Also called the exercise price. For call options, this is the price at which the option holder (buyer) can purchase the underlying security. The strike price usually trades in increments of $2.50 when under $25, in $5 increments when above $25, and in $10 increments for strike prices above $200. Some stocks and exchange-traded funds trade in $1 increments and others in $2.50 increments (above $25) as a result of a stock split. Additional exceptions will be addressed in future articles. 2- Symbol– These are the ticker symbols for options. They identify the underlying equity, the strike price, the expiration date and identify it as a call or put option. The option ticker symbol will always contain the ticker of the underlying security (in the above chart “MELI”). 3- Last– This is the price at which the last trade of that particular option was executed. For example, in the above chart, the last trade for $50 strike was executed @ $1.60. 4- Change– This column indicates how much the price of the option has risen or fallen from yesterday’s closing price. In this options chain, the $50 strike had increased $0.10 from the prior day’s closing price at the time the information in the chart was obtained. 5- Bid– The price at which the market makers are willing to buy your option, or in other words, the price you will receive when you sell an option (sell at the bid, the lower price). 6- Ask– The price at which market makers are willing to sell the option, or in other words, the price you will pay when you buy an option (buy at the ask, the higher price). 7- Volume (Vol) – The number of contracts traded for that option during that trading day. The higher this daily volume, the more “liquid” this option contract becomes vis a vis options with a lower daily volume. However, because each trading day brings a new daily volume, volume is not the most accurate measure of option liquidity. Furthermore, obtaining historical daily volume information for options is much more difficult than obtaining historical daily volume information for stocks. 8- Open interest– The open interest of an option contract is the number of outstanding options of that particular option which currently have not been closed out or exercised. For example, if the open interest for a particular call option is 1,000, this means that there are currently 1,000 active options that have either not been exercised or sold. Because an option is simply a contract, more contracts can be created every day, however the current open interest figure allows investors to gauge the extent of interest that investors have in a particular option contract. It is a cumulative figure, not a daily statistic as with volume. The higher the open interest, the more liquid the option contract is considered. Now that we are familiar with primary components of an option chain, let’s view an example of how we can use the option chain to calculate ROO or time value, using the option chain in the above chart for our example. Assume we buy 100 shares of MELI @ $50. Our cost basis for the purchase of the underlying equity is thus $50/share for a $5,000 total investment. Since we now own 100 shares of MELI, we can sell 1 call option (which equals 100 shares) of MELI in order to be “covered” (i.e. we own 100 shares of MELI, and sell someone else the right to buy 100 shares of MELI from us). For this example, assume we sell one $50 strike (one MELI call option with a strike price of $50) for $1.50. Remember, we always sell at the bid, not at the ask unless we negotiate a better price by “playing the bid-ask spread”. We are selling an at-the-money option because current price of MELI is equal to the strike price of the option. Accordingly, the $1.50 option premium we receive consists only of time value (it does not have any intrinsic value), and as such, the entire $1.50 option premium is considered profit. All the mathematics is calculated for you with the Basic Ellman Calculator and the Elite Calculator (free to premium members). Simply access an option chain and enter the stats into the appropriate tab of the calculator. For the week, the S&P 500 was nearly flat, falling a modest 0.4% for a year-to-date return of (-) 8.7%, including dividends. A concern would be a bearish break out of these ranges on high volume. A bullish bounce is what we are looking for next week. As a result I am downgrading my outlook slightly to neutral but will remain fully invested. Investors new to this strategy may want to take an extremely cautious approach to this market. Do you have a minimum OI you look for when selling options? In the example you give in this article how would you “negotiate a better price using the bid ask spread”? rise with time? Doesn’t the intrinsic value of the option change dollar for dollar with the change in stock price or is the delta invoved. The large calculated change in TV seems odd. If I close the position now, buying back the option and selling the stock–I lose 2 dollars per share. So I’m not fully protected during the life of the option. Only if the price stays above 105 at expiration. Right? Thanks for all you do for the little guys. As a guideline, I like to see a minimum of an open interest of 100 and/or a bid-ask spread of $0.30 or less. The Weekly Report has been uploaded to the premium member’s website. Look for the report dated 09-30-11. In the example above, the $50 strike has a bid-ask spread of $0.25 ($1.50 – $1-75). Rather than putting in a market order ($1.50), try a limit order of $1.60. I usually will find the mid-way point of the spread and drop a bit in favor of the market maker. Frequently you will receive the extra cash and this will add up over time. You have nothing to lose by approaching wide bid-ask spreads in this manner. I can’t tell you how good it makes me feel when our members ask such sophisticated and pertinent questions. 1- You calculations are near-perfect by the BCI methodology, perfect when using conventional cc calculators. When I calculate the ROO for an I-T-M strike (105), I use the time value only as the initial profit and use the intrinsic value to buy down the cost basis to $105, not $ 101.34. That changes the ROO from 3.6% to 3.5%. 2- Time value rising with time: This makes perfect sense because the stock price is dropping in value. TV of premiums approach zero the deeper in-the-money the strike is. As the market price drops, the strike is “less in-the-money” and therefore the TV rises. Out-of-the money strikes, for example, consist only of TV. In other words, the option premium is giving us more TV but less protection (IV). These are the pros and cons of different strikes that I talk about in my books and DVDs. 3- Option premium (not just the IV compnent)changes nearly dollar for dollar in-the-money strikes. Option premium dropped by $16.44 while the stock price declined by $18.90. Delta does play a role here as the closer to “1?, the more precise the relationship will be to 1-to-1. 4- You are never fully protected when dealing with stocks and options. We are being paid for the risk involved (in the stock). That is why one of our mission statements is to minimize risk and be prepared for exit strategy execution. 5- As it currently stands, your 3.5%, 1-month return is protected as long as the stock remains at or above $105. Your breakeven is $101.34. 6- There are no “little guys” in the BCI community…only VIPs! When you buy back an option do you roll down at the same time or do you wait to see what the stock does? In normal market conditions I will first look to “hit a double” if early in the contract cycle and roll down if later in the cycle. A stock underperforming the market in a bearish environment is sold. If a company is involved in a merger or spinoff where can we get info on the effect it has on options? Do you ever sell an option against a penny stock? This may help those of us who don’t have a lot of money to invest. As a suggested topic for your cc series and blog have you ever written about writing covered calls on the bull/bear leveraged ETF’s? I was looking at FAS today and noticed that the Deep ITM calls were strangely priced. The underlying was $9.03. An November ITM $7 call was bid $3.15. That is 2.03 intrinsic value and 1.13 time value for 43 days? Breakeven would be $5.88, simple return on the $7 is 16% for 43 days. I don’t understand these 3x ETFs other than they are really good and going down over time. Even so this seems strange that a Deep ITM call would still carry such a high time value and thought you might have a perspective. Securities like FAS use derivatives to achieve a specific daily goal (3x, 2x a certain index either direct or inverse). Because results are designed to be dramatic compared to the index, the implied volatility of the option is increased. IV is one of the main factors impacting the value of an option premium. The higher premium is a plus but the corresponding risk of the underlying dropping dramatically is not. Covered call writing is a conservative strategy attractive to investors with a low risk tolerance. That is why I do NOT like leveraged ETFs for this strategy. It may be appropriate for extremely sophisticated investors who fully understand all the risks involved and are comfortable with those risks. It is NOT for the average retail investor. I do NOT use “penny stocks” in my covered call portfolio. If we define a penny stock as one that trades under $5 and off the major exchanges, they will not meet the strict fundamental and technical requirements of the BCI methodology. These are generally small companies with highly illiquid and speculative shares that are not subjected to the traditional regulatory requirements. Bid-ask spreads are typically large, a big negative for cc writers. Stay away! Are all stocks that trade under 5 considered penny stocks? What about Citi when it was at 3? 5- Is subject to traditional SEC standards and regulation. Price is only one parameter that defines a penny stock. This stock has been on our premium watch list for 4 weeks. On August 2nd, a stellar 2nd quarter earnings report was announced. Revenues rose by 18% and earnings surprised by 14% over the past 4 quarters. It holds $104M in cash with no long-term debt. Analyst estimates are up with a bullish growth projection of 210%. It does trade at a pricey 30x forward earnings. LQDT recently hit an all-time price high and is holding up in this volatile market. The premium watch list shows an industry segment rank of “A” and a beta of 0.91. If a stock is trading right at the strike price on expiration Friday, will the stock be sold? As a general guideline, if a stock is trading as little as $0.01 above the strike when the option expires it will probably be exercised and your shares sold at the strike price. This can happen sometimes when the price is trading slightly under the strike @ 4PM on expiration Friday as the orders are finalized a few minutes past that time when we can no longer take action. The bottom line is that if you want to keep your shares and the price is within a few cents of the strike (as 4PM EST approaches) , you should buy back the option or roll the option. Great video on the homepage! Really explains to us newbies how this strategy works. The vix closed at 36.20 today. Do you consider this a bullish or bearish sign? The VIX did improve the past week but has yet to establish a definitve trend since its acceleration from 18 to 47 in late July/early August. Right now, it’s still too high but holding within the recent range. I will be constructing a chart to highlight this in my upcoming blog artcle which will be published late Saturday or early Sunday.